Brent Council - Encouraging kids to be more active with Brent’s Daily Mile! Encouraging kids to be more active with Brent’s Daily Mile! Head teachers from primary schools across the borough put their best foot forward and descended on Brent Civic Centre recently to find out more about Brent's Daily Mile. Brent Council in association with Sport England, hosted an information day about the initiative which aims to get primary school children out of the classroom and their heart rates pumping for 15 minutes every day. The aim of The Daily Mile is for children to walk, jog or run at their own pace - it's non-competitive and inclusive for all, regardless of age or personal circumstance. The impact of The Daily Mile can be transformative: not only does the children's fitness improve drastically within four weeks - providing greater access to Sport and PE, but there are wider benefits to their emotional, mental and social Health and Wellbeing. Elaine Wyllie, founder of the Daily Mile, who presented at the session in Wembley said: "It's a common sense approach to children's fitness, which is free and easy. The most important thing is that the children really enjoy it, otherwise you couldn't sustain it. They come back in bright-eyed and rosy-cheeked, how children used to look. It's joyous to see." Cllr Krupesh Hirani, Cabinet Member for Community Wellbeing said: "The Daily Mile is a simple but effective concept, which any primary school or nursery can implement. "Children in Brent have worse than average levels of childhood obesity. Around 10.5 per cent of children aged 4 to 5 years and 24.1 per cent of children aged 10 to 11 years are obese which is disappointing but the progress being made is promising. "We want to make it easier for people to adapt their behaviour and encourage them to make small changes to their diet and lifestyle by providing the support they need to do so. "Brent's Daily Mile is being run as part of 'My Heart Beats for Brent' campaign which aims to get all Brent residents more active." Tottenham Hotspur, who are currently playing their UEFA Champions League home games in Wembley, are supporting the 'My Heart Beats for Brent' campaign. Former England and Tottenham player, Gary Mabbutt MBE, joined head teachers for a walk around Wembley Stadium as they embarked on their own version of the Daily Mile. 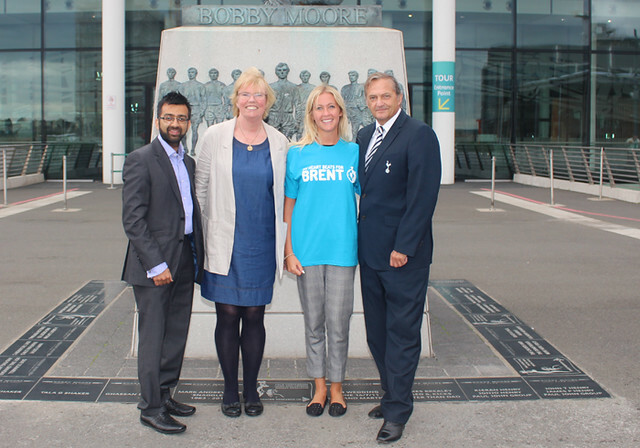 Mabbutt said: "Given we are playing home matches in the Borough of Brent this season, it is important for us as a Club to engage with the local community here as we do in Tottenham. "We aim to work closely with Brent Council to deliver life-changing opportunities to the people of Brent through our award-winning Foundation as we have done successfully over the past 10 years at home in Haringey. "Examples include supporting the Council's 'My Heart Beats for Brent' campaign, and as well as encouraging children to take part in 'The Daily Mile', we shall be delivering free health checks at various community venues using a qualified 'Spurs Nurse'."